J.J. Watt’s stellar season continues. He added an interception returned 79 yards for a touchdown in yesterday’s 23-17 Houston Texans win over the Buffalo Bills, despite Watt apparently being exactly where the opposition wanted him. He has 16 quarterback hits, 13 hurries, three batted passes and a blocked extra point, all of which either lead the NFL or are simply remarkable for a 3-4 defensive end. But he also has a receiving touchdown, that one yard grab he pulled in against the Oakland Raiders. When coupled with his pick-six yesterday, that puts Watt in rarefied company that, interestingly, includes Mike Vrabel, now the Texans linebacker coach. According to the Elias Sports Bureau, Watt is only the second player since the NFL-AFL merger in 1970 with a touchdown reception and an interception returned for a touchdown in the same season. The other was Vrabel. Fun facts aside, Watt’s contribution to a 3-1 Texans team has been simply incredible. If he keeps this up, and if Houston takes the AFC South (and maybe even if they don’t), Watt is entering the discussion for league MVP. Only two defensive players have ever won (Alan Page, Lawrence Taylor) the last in 1986 (Taylor). Nate Ebner (43) leads the Patriots with five special teams tackles this season, and has registered the first two defensive tackles of his career. FOXBOROUGH — Before the sixth play of last Sunday’s game between the Patriots and Raiders, Nate Ebner left the sideline and joined his teammates on the field. Except the Patriots weren’t punting or kicking, and weren’t receiving a punt or kick. This play didn’t require any of the special teams units. No, Ebner was sent in to play in the Patriots’ sub package, when they wanted an extra defensive back because they were expecting the Raiders to pass. Which Oakland tried to do in this instance, but Derek Carr’s third-down attempt fell incomplete. Ebner checked in the next time the Raiders’ offense faced a third down. And the next, and the next, and the next. He got 10 defensive snaps in all, one week after playing a career-high 14 defensive snaps against Minnesota. Not bad for a special teams regular who played just three defensive snaps while at Ohio State. Not in a game, or even a season. Ebner was on the field for three defensive plays the entire time he spent with the Buckeyes. Now, in his third season with the Patriots, Ebner has been called upon to assist with one of the most important jobs a defense has: Stop the other team on third down, force a punt, and get your offense the ball back. Playing defense might not be something Ebner did much of before, but he’s doing it now, and doesn’t seem impressed or awestruck or concerned about why. 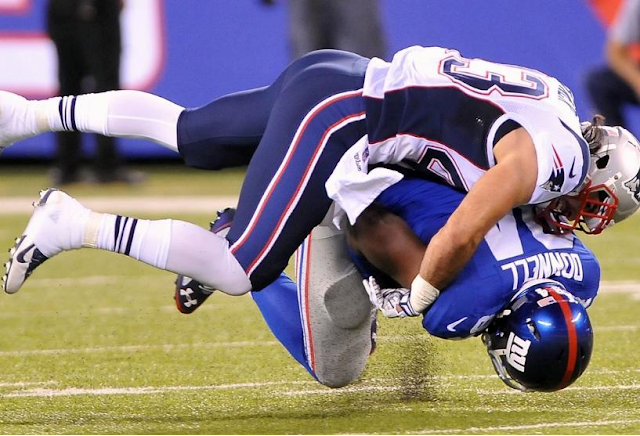 Patriots fans might be familiar with Ebner’s story, but the key points bear repeating. He didn’t play football in high school. At all. His focus was rugby, and he was good enough to play on multiple United States national teams. He finally gave football a try when he enrolled at Ohio State: Initially as a walk-on, but then he earned a scholarship. Ebner’s role with the Buckeyes was almost exclusively contributing on special teams. Despite his lack of playing experience, the Patriots selected Ebner in the sixth round of the 2012 draft, a head-scratching novelty pick to most draftniks. Only, the Patriots never viewed him that way. Here Ebner is, two-plus seasons later, a veteran of 33 regular-season and four playoff games in the NFL. Ebner is listed on the unofficial depth chart as a third-string safety, and at 6 feet, 210 pounds would be considered way too small to play linebacker in the NFL. But against the Raiders, Ebner had his share of snaps lined up where a linebacker would typically play. The Patriots used Ebner in a variety of ways: He was on the line of scrimmage during the Raiders’ second series, and was picked up by an offensive lineman on a blitz. He also frequently covered tight end Mychal Rivera, who finished with two catches for 11 yards. Ebner brought down Rivera after a 3-yard gain early in the second quarter; since the Raiders needed 10 yards to pick up a first down, Ebner’s tackle — one of two he was credited with in the game — guaranteed that a fourth-down punt was coming from the Raiders. This transformation, from a special teams fringe player to a third-down sub addition, hasn’t been easy, or overnight. Ebner is quick to credit the reasons it’s been possible: a willingness to learn, a coaching staff willing to teach, and teammates willing to help. “I spend a lot of time with [safeties] coach [Brian] Flores. I have to say that I’ve learned quite a bit from the veteran guys as well, we’ve had great leadership the years I’ve been here,” Ebner said. “They’ve been in the league for a while, and they know more about the details, every aspect of playing safety, so I just try to take as much as I can from them. Learning a new position is easier for some than for others. Ebner was named an all-academic selection by the Big Ten while at Ohio State. “He’s a smart guy, he really picks things up,” said Devin McCourty, who made the switch from cornerback to safety after joining the Patriots. “The crazy thing with Nate is he understood a lot of what we were talking about from the very beginning. I remember his first training camp he was always around the ball. He ended up with four or five interceptions in like two weeks. According to team statistics, the two tackles Ebner had on Sunday are the only two defensive tackles in his NFL career. He does have 33 special teams tackles — including a team-high five this season — and might best be known for the two fumble recoveries he had on special teams last year. The first, in overtime against the Broncos, led to a winning field goal. So, how good of a defensive player can Ebner become? Tsk-tsk. You’re forgetting that he doesn’t place limitations on himself. 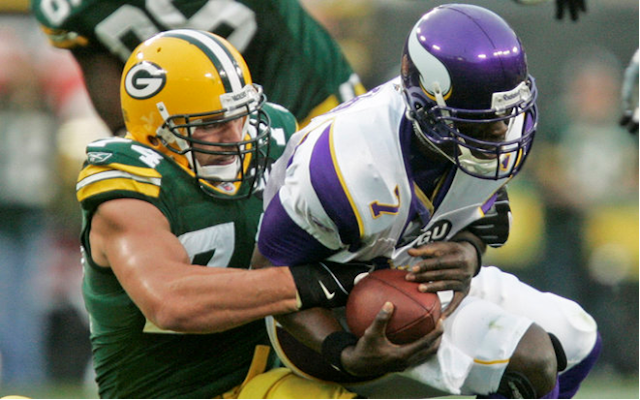 Aaron Kampman led the Packers in sacks in 2008, including this one of Minnesota’s Tarvaris Jackson. Green Bay — Aaron Kampman stood in the Lambeau Field tunnel, surrounded by former Packers players dating back five decades. Moments after walking onto Lambeau Field for halftime introductions during alumni weekend Sept.14, Kampman talked with long-time members of the Packers' game-day operations crew. Kampman updated staffers on how he was building a house for his family of six, cutting the oaks from his Iowa land for the floors. "It's a great thrill to go out that tunnel," Kampman said. "In front of these great fans. "But what I remember most is not the games or the wins or losses. I remember the people: my teammates, coaches and the people who worked here behind the scenes. At the end of the day, you remember the people." Kampman, 34, will be remembered as one of the most productive pass rushers in franchise history, recording 54 sacks to rank fourth on the all-time sack list, behind only Kabeer Gbaja-Biamila (74 ½), Reggie White (68 ½), and Tim Harris (55). The 6-foot-4, 265-pound defender was a blue-collar player who endeared himself to Packer fans with his unselfish and relentless play on the field and his commitment to his family and others off it. Kampman was drafted by general manager and head coach Mike Sherman in the fifth round of the 2002 NFL draft. He had all the measurables (4.74 in the 40-yard dash, 33-inch vertical leap, 420-pound bench press) to warrant being drafted earlier, but was available when Green Bay made the 156th overall pick. Kampman once semi-jokingly attributed his later draft position to the perception of being labeled "a slow white guy" from the University of Iowa. No matter the label, Kampman did what he always does: roll up his sleeves and work to earn a spot. That approach has served Kampman well since high school, where he played for one of the most influential figures in his life: head coach Ed Thomas at Aplington-Parkersburg. He had a decorated prep career as a linebacker, earning Iowa Class 2A player of the year, Parade Magazine All-American, and USA Today second-team All-American honors. His college career at Iowa began at linebacker, but ended with one hand in the turf. After starting 11 games at linebacker in his sophomore season, he was switched to defensive end. Kampman blossomed, earning first-team All-Big Ten and academic All-American honors in his senior year and serving as a Hawkeye co-captain. Kampman quickly showed he had the attitude, intelligence and ability to be successful on the NFL level. He started six games as a rookie, sharing time at left defensive end with Vonnie Holiday. He recorded just a half-sack in Green Bay's 12-4 season, but would increase his productively exponentially over the next three seasons. "Aaron has a phenomenal work ethic and leadership on the field and off," said defensive line coach Bob Sanders in a 2005 article. "He takes care of himself as far as the weight room, he's ready to go every day, and he's the kind of guy that loves the game. "He's done an excellent job in developing his pass rushing skills.... Enthusiastic guys like that are fun to be around and fun to coach. He commits so much to the game and it makes me as a coach be the best I can be to help him." Kampman totaled two sacks in 2003, 4 ½ in 2004, and 6 ½ in 2005 before his breakout season. In 2006, he led the NFC and was second in the league with 15 ½ sacks, earning All-Pro and Pro Bowl honors in Mike McCarthy's first season as head coach. He also set a franchise record for tackles by a defensive lineman with 113, breaking the previous mark of 107 recorded by Ezra Johnson in 1983. Kampman was twice named NFC defensive player of the week — joining Reggie White (1998) as the only Packers defender to accomplish that feat. He followed up his career season with 12 sacks in 2007 to again pace all Packers players. Green Bay advanced all the way to the NFC Championship Game, losing in overtime, 23-20, to the New York Giants at Lambeau Field. "It was a great season," Kampman said of the 13-3 campaign. "We came back to beat Seattle in the 'Snow Globe' game in the playoffs and then lost a tough one in the cold to the Giants for the championship." It was also Kampman's last season with Brett Favre, and their relationship went far beyond the gridiron. "Brett was a great football player and teammate and so much fun to be around," he said. "I'm so glad that I got to know him as a person." He registered a team-high 9 ½ sacks in 2008 during a turbulent 6-10 season — the first with Aaron Rodgers succeeding Favre as the Packers starting quarterback. In 2009, Kampman was switched to linebacker in a coaching move that was questioned and scrutinized by the media, but never by the player himself. Ever the consummate team player, Kampman did his best to perform in his new role at left outside linebacker. As rookie Clay Matthews emerged as Green Bay's premier pass rusher, Kampman finished fourth on the team with 3 ½ sacks. Matthews led the team with 10, followed by Cullen Jenkins (4 ½), Nick Barnett (4), and Brad Jones (4). Kampman's season was cut short by a knee injury that landed him on injured reserve in early December. In March 2010, he signed a lucrative $25 million, four-year contract with the Jacksonville Jaguars. In two injury-filled seasons, Kampman recorded just four sacks and was released in June 2012. He formally retired from the NFL in 2013. "I was fortunate to play in the National Football League and had eight great seasons in Green Bay," he said. Kampman said it was difficult to single out games or performances, but he did mention the Packers' thrilling 34-31 victory over the Vikings in Minnesota on Christmas Eve 2004, when Ryan Longwell booted a 29-yard field goal as time expired to clinch the NFC North Division title. Sherman granted the team a three-day weekend off for the accomplishment. "That was a great victory on Minnesota's home field," Kampman said. "I had a pretty good game I think. And it was great to have the extra time off at Christmas to spend with my family." Kampman is noted for his faith and devotion to his family, which was a product of his blue-collar Iowa roots. He grew up in Kelsey, a small Iowa town with no stoplights and a population of approximately 80. Hard work was and still is a way of life in the rural community. Kampman's father, Bob, owned a lumber yard and his grandfather farmed 200 acres. Bob Kampman's three sons loved nothing more than to accompany him to the lumberyard and help stack wood, sweep floors or assist with any other chores. "My dad was my role model," Kampman said. "We wanted to be like him." When the boys entered high school, Aaron and his older brother, Andy, started their own shingling business, Kampman Construction. Kampman returned to his high school in the fall of 2008 to give a pep talk to the football team after the high school was destroyed by a tornado. Today, Kampman and his high school sweetheart and wife, Linde, are enjoying the process of building the dream home for their family. "A labor of love," he said with a smile. Kampman still closely follows the Packers and is an assistant line coach at his children's high school. "It's great to come back to Lambeau and visit everyone," Kampman said. "I enjoyed playing here and we have many great memories of being part of the Green Bay community and Packers organization. This is a truly a special place." Packers highlights: Unheralded draft choice who developed into one of the NFL's elite pass rushers. Led Packers in sacks from 2006-'08, including career and NFC high of 151/2 in 2006. Pro Bowl selection (2006-'07) and named All-Pro (2006-'07). Played in 112 regular-season games in Packers tenure. Other teams: Jacksonville Jaguars (2010-'11). Occupation: Currently serving as general contractor and assisting in building his family home. Also an assistant high school offensive and defensive line coach. The third-year defensive back continues to make big strides. FOXBOROUGH, Mass. — Except for the occasional “there’s no other quarterback I’d rather have than Tom Brady” quote, Bill Belichick seldom praises players or offers much when asked about their development. So it was more than a little surprising to hear him speak so highly about third-year defensive back Nate Ebner earlier in the week. Nate Ebner never was seen as an NFL player, not while starring on rugby youth teams for the U.S., and certainly not as a walk-on football player at Ohio State. But the Patriots chose him with the 197th pick in 2012 and love his progress. Given that Belichick on Sunday became the sixth coach in NFL history to win 200 regular-season games, that’s high praise. Given that Ebner had little football experience before the Patriots selected him out of Ohio State with the 197th pick in the 2012 draft, that’s remarkable praise. The 25-year-old Ebner was a rugby player growing up in Dublin, Ohio, introduced to the sport when he was 12 by his late father, Jeff. And he was really good. When he was 17, Ebner was selected to play in the National 7′s – the youngest player to achieve that accomplishment. He played fly-half – and pretty much anywhere on the back line – for the U.S. U-19 and U-20 rugby teams from 2006-08. He was named the most valuable player of the Rugby World Cup in 2008 while with the U.S. U-20 team. Football was something he liked to watch, but when he enrolled at Ohio State in 2009, he knew he couldn’t juggle academics and an international rugby career. So he gave up that part of his life and joined Ohio State’s rugby club. Not long after, he talked to his father about walking on to play football for the Buckeyes. When his father was killed during a robbery of the family’s business, football became Ebner’s release. He combined aggressive play with natural skills – he’s a muscular 6 feet, 210 pounds with speed – and eventually earned a scholarship as a special teams player. Still, no one could have predicted an NFL career. Except maybe the Patriots. They tend to find those diamonds in the rough. There’s offensive guard Stephen Neal, an NCAA Division I champion wrestler who won three Super Bowls and played 10 years before shoulder injuries forced his retirement. There’s quarterback Matt Cassel, a perennial backup at Southern Cal who led the Patriots to an 11-5 record in 2008 after Brady suffered a knee injury. Cassel has since started for two other teams. Taking a world-class rugby player and making him a defensive back? No big deal, right? “Nate has, I’d say, far exceeded our expectations defensively based on what he had coming out of college,” said Belichick. Ebner has made his mark as a special teams player – he had the fumble recovery in overtime to set up the winning field goal in last year’s wild 34-31 win over Denver – but he is improving on defense. In 2013, he got just five snaps on defense all season. Sunday, in a 30-7 win over Minnesota, he was on the field for 14 defensive snaps. Maybe that doesn’t seem like a lot, but it shows the Patriots’ growing confidence in his abilities. Ebner said he’s just trying to do his best. Asked if playing rugby has helped him with football, Ebner said some skills cross over but not many. But playing on the national team at a young age provided lessons that helped him make the leap to football. “Playing eighth grade at the national level, being held to a professional level, prepared me for a future with Ohio State and the Patriots,” he said. It wasn’t easy to give up rugby, but Ebner believes he made the right choice. Now in his third year with the Patriots, Ebner believes he has a greater understanding of not only what the team is trying to do on defense but what the opponents are trying to do on offense. “With anything you do, when you have more repetitions you start to see things quicker,” he said. He knows he still has a lot to learn but has great belief in his ability. “If you do everything you can to get better and progress, the rest will take care of itself,” he said. Ebner was asked if he missed rugby, especially with the sport returning to the Summer Olympics in 2016. J.J. Watt has done just about everything there is to do as a defensive end for the Texans, so he expanded his portfolio against Oakland last weekend. Watt played a couple of snaps at tight end during the 30-14 victory and caught a touchdown pass from quarterback Ryan Fitzpatrick. Watt said Wednesday, via Art Stapleton of the North Jersey Record, that he was “most definitely” ready for more if the coaches want to give it to him. Coach Bill O’Brien is willing to do that or at least make others think he’s willing to do that. Jordan Raanan of NJ.com reports that O’Brien said we should expect to see more of Watt at tight end in a future that starts with this week’s game against the Giants. Watt has a pretty good shoulder to lean on when it comes to moonlighting on offense. Texans linebackers coach Mike Vrabel caught 10 regular season passes for 10 touchdowns while he was a linebacker for the Patriots and Chiefs. Vrabel added two more in Super Bowls XXXVIII and XXXIX that helped the Patriots hold off the Panthers and Eagles and added up to a nice little side business. No matter where he goes, Ted Ginn Jr. is a dangerous kick returner. Ginn, the Cardinals’ punt and kickoff returner, was named the NFC special teams player of the week award today. It’s the third time Ginn has been named special teams player of the week — with the third different team. Ginn won AFC special teams player of the week with the Dolphins in 2009, when he returned two kickoffs for touchdowns against the Jets, and won NFC special teams player of the week with the 49ers in 2011, when he returned both a punt and a kickoff for a touchdown against the Seahawks. This week Ginn got the award for a 71-yard touchdown that helped the Cardinals beat the Giants. The Cardinals were trailing with 10 minutes left in the fourth quarter, but Ginn raced through the Giants’ punt team and into the end zone to give Arizona a lead it wouldn’t relinquish. The 29-year-old Ginn has 7,920 career return yards, putting him 18th in NFL history. 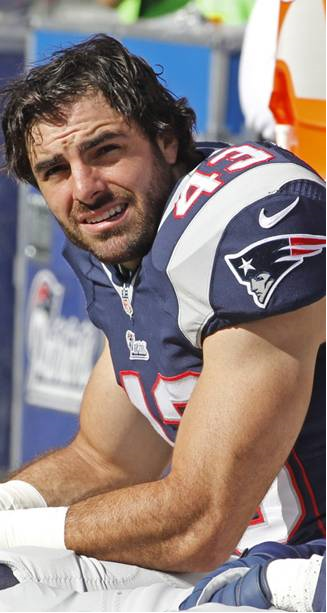 Since training camp, Nate Ebner has slowly worked his way into the mix as a member of the Patriots defense. 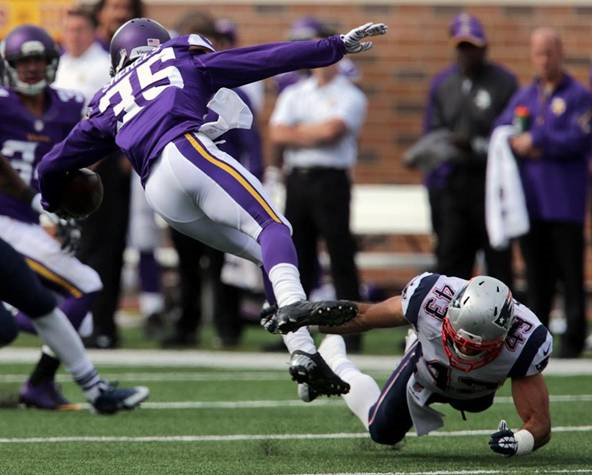 A core special-teamer since his rookie season in 2012, the safety out of Ohio State -- who hardly played at all as a defender in college -- has earned more trust from the Patriots coaching staff and found himself on the field for 13 defensive snaps in a win over the Vikings in Week 2. Per Mike Reiss of ESPN Boston, Ebner played just five defensive snaps all of last season. "We certainly have a lot of confidence in Nate," Bill Belichick said in a conference call Tuesday. "We’ve seen Nate grow and improve. I would probably put him in the -- not the all-time top, but maybe in the top five percent all-time of players that I’ve coached from where they were in college to how they grew in the NFL. "Nate had almost no defensive experience at Ohio State. He’s adapted in a relatively short amount of time -- going into his third year so it’s really two-plus years -- adapted very well to the knowledge of our defense, to the understanding of opponents’ offenses, to instinctiveness and reading and recognition at a position that he plays right in the middle of the field, which is among the most difficult -- inside linebacker and safety -- where the volume and the number of things that can happen are the greatest, where you have to really see everybody on the field, all 11 guys. His development has really been outstanding. "I think [safeties] coach [Brian] Flores has done an excellent job training him. I think Nate has worked very hard and the play time that he’s earned defensively has come through his hard work and performance and consistency. It’s really been good." Ebner has played a sort of hybrid linebacker-safety role that has also been occupied by Tavon Wilson at points this season. It's one of the handful of jobs in the Patriots secondary where there's been a good deal of movement and various players attempting to carve their own roles. "We have, I think, a number of good players at that position," Belichick said. "There’s a lot of competition there and there’s not an unlimited number of opportunities for all those guys, but we have a lot of confidence in that position. They all played solid roles for us last week, defensively as well as in the kicking game. I think we’re very fortunate to have the quality of players that we have at that position. "Nate has, I’d say, far exceeded our expectations defensively based on what he had coming out of college. Players like Steve Neal, with zero experience, [Matt] Cassel, very little playing experience at Southern Cal, guys like that, Nate, very little defensive experience at Ohio State, for those guys to become the type of players that . . . I’m not putting [Ebner] in that class yet, but I’m saying the evolution and development for guys like that is pretty significant relative to a lot of other players who have just had a lot more opportunity than guys like that have." Early in the year, especially before teams make their final training-camp cuts and establish a 53-man roster, there is a significant value placed on special teams. If there is a position battle where one player has special teams ability and the other doesn't, that can help make a decision as to whether or not a player gets a spot on the team. Back before the Patriots made their final cuts this year, Belichick explained that while it's necessary for offensive and defensive players to have special teams ability, it's also vital that some elite special teamers -- guys like Ebner and Matthew Slater -- have the ability to chip in on offense or defense. "If a guy’s major role on the team is the kicking game, then any role that he can handle on offense or defense just helps your team, gives that player more value and gives your team more depth," Belichick said in late August. "It’s the reverse of the offensive and defensive players who have significant roles, but can give you a role in the kicking game, that can do something in the kicking game that can help the team. Those are valuable on special teams as well, to have somebody step in and do something for you there when they also have a big role on offense and defense. That just gives your team more depth. "And particularly for special teams players, and we’ve seen so many examples of it through the years: guys that start off on the kicking team end up developing into good offensive or defensive players, and the offensive and defensive coaches are able to start using those players in roles and expanding their roles because they know that those guys are going to be there every week." As Belichick pointed out, part of the reason Ebner has been able to expand his duties on defense is that he's on the 46-man game-day roster every week due to his special teams value. For example, someone like Kenbrell Thompkins has the ability to contribute on offense, but because he does not play on special teams, he was inactive in Week 2. Instead, receiver Brandon LaFell was active thanks in part to the fact that he plays in the kicking game. "Really the guy that kind of is a tough fit on the roster on game day is the player who has a role on offense or defense -- not a major role but a role -- but has a small role in the kicking game or maybe in some cases doesn’t have a role in the kicking game," Belichick said. "If it’s not a big enough role offensively or defensively, whatever the case might be, then it’s hard to get that player to the game if he doesn’t have a role in the kicking game. You end up usually, often times going with a player who has a big role in the kicking game and maybe not so much of a role on offense and defense, just because that role in the kicking game is bigger. "It’s interesting how it works out. In my experience, I’d say that guys who are good in the kicking game actually have the chance to get a bigger role on offense and defense than some players who might be ahead of them on offense and defense but don’t play in the kicking game, because the coaches just can’t count on them being there on game day." And when it comes to Ebner, Belichick believes he's made the most of his chances. "He’s a good example," Belichick said, "of the player that I was talking about whose role expands on defense because of his role in the kicking game." An interesting piece yesterday by the New York Times took a look at a new study by researchers at Vanderbilt. The study dug up 947 coaching contracts from 2005 to 2013 and compared them to CEO’s at public companies and they concluded that, contrary to popular opinion, coaches are not overpaid when you look at the whole picture. Randall S. Thomas, a law and business professor, and one of the authors of the study, notes that “coaches are running large programs that have tremendous value,” and added that coaching salaries compare “quite directly to public company C.E.O.s.” Look no further than the similar responsibilities, scope of influence, and overall demands of the job to see the direct correlation. That’s an interesting comparison because, I have to imagine that in the court of public opinion, many people would say that CEOs are grossly overpaid. Neil Cornrich, an agent who represents major college coaches like Bret Bielema, Bob Stoops, and Kirk Ferentz, told the NY Times (what the coaching profession sees as obvious) that coaches create value for a university, and that the value that they create is not difficult to quantify. Plus, when it comes to salaries, coaching is a lot of other professions, in that individual salaries are market-driven. “There are very few people that are able to properly handle these jobs, particularly for a period of time, where it adds great value to the university.” Cornrich explained. 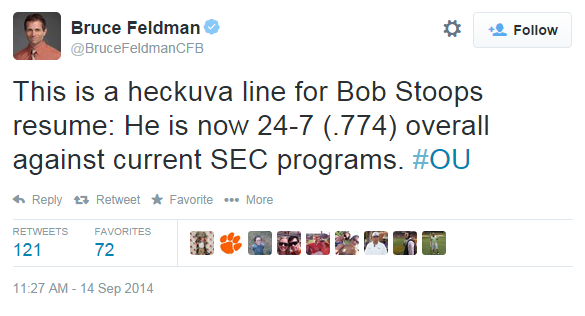 Guys like Nick Saban, Frank Beamer, Bob Stoops and Kirk Ferentz are great examples of that. “If one believes that C.E.O. compensation is set by the market at an appropriate level, and that employment contracts reflect this equilibrium, then one should reach the same conclusion about football coaches.” Thomas went on to explain. Take a look at some of the most recent incentives in coaching contracts and the parallel between coaches and CEOs is more and more clear. For example, take Rich Rod’s new deal at Arizona; back in June, Rodriguez signed a contract extension that included shares in an unnamed company, granted he stays in Tucson as the head coach of the ‘Cats for the next eight years. On top of that, coaches nearly always have achievement based incentives, and the use of private helicopters and jets in their deal as well. In a lot of ways, the comparison between the two high profile jobs makes a lot of sense. OAKLAND, Calif. -- Texans defensive end J.J. Watt can do it all. Turns out, not just on defense. The Texans took an early lead over the Oakland Raiders on Sunday with a one-yard touchdown pass from quarterback Ryan Fitzpatrick to a wide-open Watt. It was Watt's first professional offensive touchdown. "My goal in the offseason is to create the best athlete I can create and give it to the coaches and say here, use it how you want," Watt said. "... Today they used it a little bit on offense." The NFL's highest-paid defensive player made the play one week after one of the best games of his career. In Week 1, Watt notched a sack, batted pass, two tackles for loss, a fumble recovery and a blocked extra point. In the Week 2 win over the Raiders, he lined up twice on the goal line on offense, once to block for running back Arian Foster and once to catch the game's first touchdown. "We've been working on that for a while," Texans coach Bill O'Brien said. "You've got a guy there who's such a great athlete, 6-foot-7, 290 pounds, got really good hands. You should probably try to get him in there once in a while on offense." Watt, who initially played tight end in college, hasn't scored a touchdown on an offensive play since his senior year of high school when he played offense and defense. It wasn't the first time Watt's worked in a goal-line package in practice. The Texans' previous coaching staff, though, never used it in a game, so Watt stopped lobbying to play offense upon their departure. Their current coaching staff, though, has some experience using a talented defensive player in on goal line plays. 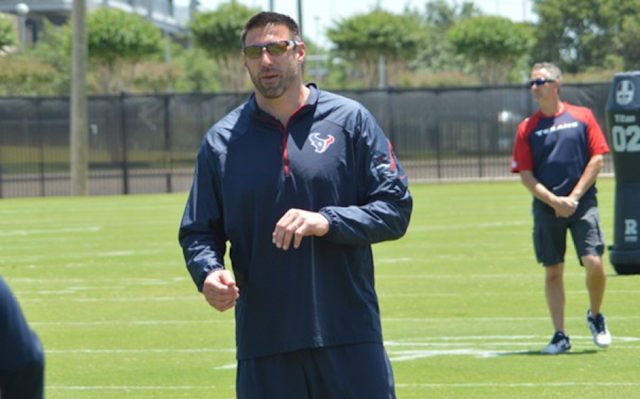 Houston's linebackers coach is Mike Vrabel, a former All Pro linebacker. While with the New England Patriots and then Kansas City Chiefs, Vrabel caught 10 passes - all of them for touchdowns. "He's one that definitely suggested these things to us throughout the offseason," O'Brien said of Vrabel. Watt, too, got some tips from Vrabel. "It was a cool experience," Watt said. "I feel like a little kid." Arkansas’ Bret Bielema earned $3.2 million last year, but won only three games. In late 2012, Arkansas hired Bret Bielema as its football coach, paying him a salary of $3.2 million a year, plus bonuses, making him one of the best-compensated coaches in his industry and his state’s highest-paid employee. But, according to a new study by researchers at Vanderbilt, coaches like Bielema who command what are widely seen as robust salaries are worth the money because of the value they bring to their universities. The Vanderbilt study, which included 947 contracts from 2005 to 2013, benchmarked coaching salaries against those of chief executive officers at public companies — another group that is often accused of being paid too much. 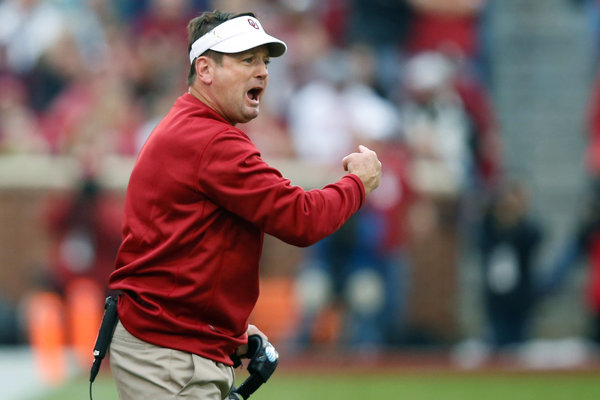 Oklahoma’s Bob Stoops commands a salary that is market-driven, according to his agent. In universities’ zest to compete, many routinely court coaches as if they were recruiting a new chief executive: offering millions of dollars, the power to hire and fire others, and even the use of a private jet. A result is that big paydays are hardly unusual in college football, in which head coaches, win or lose, have been among the biggest financial beneficiaries of the ballooning amount of cash flowing into the industry. The increasing demands to win, coupled with billion-dollar television deals, have combined to cause the average pay for coaches at the top level of Division I football to double since 2005 to $1.5 million, the Vanderbilt study found. Like chief executives, numerous coaches make more than $3 million a year and enjoy special perks, the researchers found. Nick Saban, the coach at Alabama, receives personal use of a private jet each year, in addition to his pay. Les Miles at Louisiana State has a provision in his deal that will automatically make him the highest-paid coach in the Southeastern Conference, by $1,000, should he coach his squad to another national championship. “If one believes that C.E.O. compensation is set by the market at an appropriate level, and that employment contracts reflect this equilibrium, then one should reach the same conclusion about football coaches,” wrote Thomas and co-author, R. Lawrence Van Horn, an associate professor of economics and management. The professors shared with The New York Times a draft of their report, which has not been published or peer-reviewed. To be sure, there are significant differences between a football coach and a chief executive, some of them acknowledged by the authors. One divergence is that coaches often have higher fixed salaries, while compensation for chief executives tends to be heavily influenced by performance. In addition, executive pay is also supposed to be closely monitored by experts on company boards. In some cases, the boards even have the power to take back pay that was promised to executives in previous awards. And the chief executives are often paid a substantial part of their compensation in company stock — which can fall in value if the firm underperforms — something that does not exist in college football, at least as it stands. The debate over the pay of football coaches at big public institutions is especially in focus at a time when the N.C.A.A. is facing increasing criticism. Some contend that the sizable coaching salaries are enabled by what critics call the exploitative nonpayment of college football players. Others believe the coaches’ compensation packages are evidence that the universities are overly invested in athletics and spending to keep up in sports. At the same time, there are concerns that academics and budget cuts at large public universities are being minimized. As it stands, college football coaches at public universities often make more than not only the athletic director but also the university president — and probably the governor, too — which critics like Ridpath say poses a danger to their institutions. “I don’t believe that a football coach, under any circumstance, should be paid more than their boss because it skews the power structure and causes many of the problems in academia that we have now,” Ridpath said. But others say that a reality of big-time college athletics is that top-level coaches are special talents with huge jobs, and the market demands that they be well compensated. The jobs are often short-lived, and the stress level is high. “They are worth every penny,” said Martin J. Greenberg, a Milwaukee-based sports lawyer who has represented coaches in contract negotiations for 25 years. Greenberg said that coaches nowadays suffered from what he called “role strain,” meaning they have a huge range of responsibilities, including fund-raising, recruiting, academics, being public figures and meeting with alumni. “They are asked to do just about everything under the guise of being the football coach,” Greenberg added. Neil Cornrich, an agent who represents Bielema, as well as some of the other highly paid coaches, including Bob Stoops at Oklahoma and Kirk Ferentz at Iowa, said the coaches were creating immense value, which is not difficult to quantify, and that the salaries were market-driven. “There are very few people that are able to properly handle these jobs, particularly for a period of time, where it adds great value to the university,” Cornrich said. 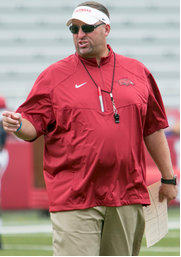 When Bielema was courted by Arkansas, the job opening was seen as one of the most challenging and intriguing. The incoming coach would be the third in three years and would inherit a team coming off a four-win season, but he would also be at the helm of a program competing with the best teams in the SEC. That was all factored into the compensation package that Arkansas offered Bielema, who was leaving a high-profile job at Wisconsin, where he coached the Badgers to three straight Rose Bowl appearances. As Bielema begins his second season on the job, Arkansas fans will be keeping a close eye on him, looking to how the university’s investment is paying off. To Bielema’s supporters, progress is already being made. “It’s already been a good investment because he has stabilized the ship,” Cornrich said.